Kalanchoe blossfeldiana, or Flaming Katy as its often called is a wonderful flowering succulent plant that provides beautiful blooms for months at a time during the winter and springtime. A really popular houseplant due to their wide variety of flower colors, long-lasting blooms, low water requirements and ease of propagation. 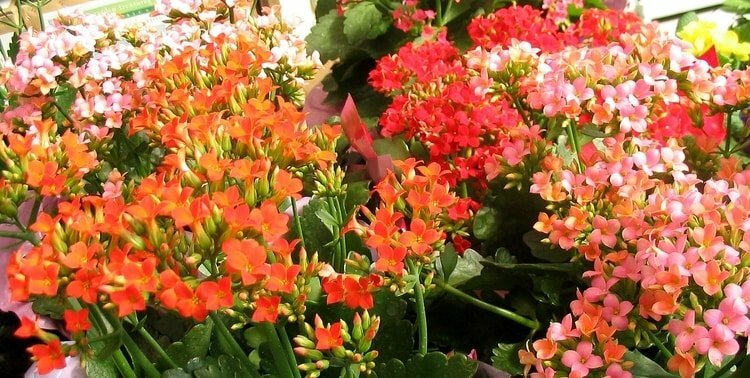 How to care for Kalanchoe Blossfeldiana – Flaming Katy needs bright, indirect light, well-draining soil and temperatures of 65-85 F. Water your Flaming Katy when the top half of the soil is dry and fertilize every few months. Remove dead flowers to encourage prolonged blooming and prune back after flowering to prevent the plant from becoming leggy. Soil: Lightweight well-draining soil. Half potting soil, half coarse sand or perlite is ideal. Container: Avoid excessively large pots. Ensure good drainage. Light: Bright, indirect sunlight. East or west facing window is great. Temperature: 65 to 80 °F (18 to 27 °C). Humidity: Normal indoor humidity levels are fine. Flaming Katy plants do well at a range of humidity levels. Watering: Water once the top half of the soil is dry. Avoid overwatering. Fertilizing: Very little fertilizer needed. Apply fertilizer about twice a year. Propagation: Can be propagated easily with stem or leaf cuttings. Many people only keep Flaming Katy as an annual, but it’s not too difficult to care for them during the year and have them rebloom year after year. There are some specific steps you’ll have to take to get a Flaming Katy to rebloom, but follow the instructions in this article, and you’ll be able to enjoy the blooms every winter and springtime for years to come. Before we move on, did you know that Kalanchoe is pronounced “kal-un-KOH-ee”? I’d been pronouncing it Kal-uhn–cho for years, but I realised my mistake a while ago. I learned that the genus kalanchoe was named after the chinese word “kalanchauhuy” meaning temple plant, so I can see where the pronunciation comes from. I’m sure people pronounce it in different ways too. How Big Does Flaming Katy Grow? 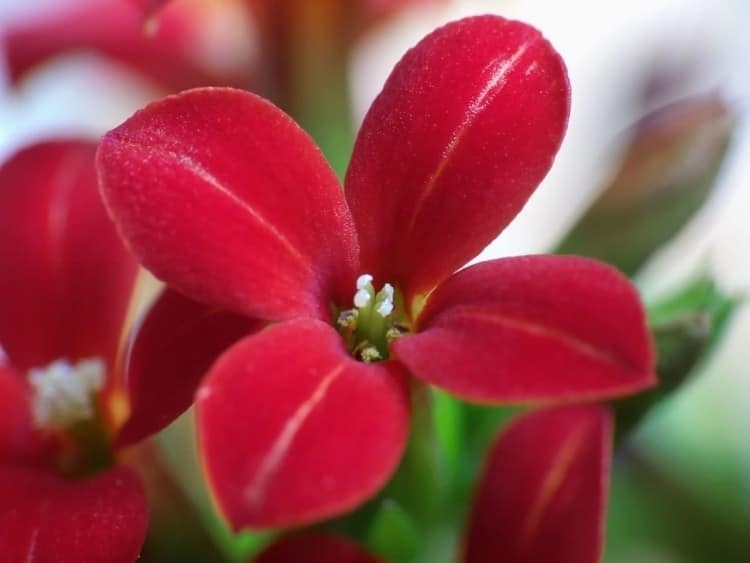 In the wild, Kalanchoe blossfeldiana grows to about 20 inches in height, but most of the plants that are sold as houseplants are dwarf hybrids that only grow to about 8-12 inches high. The spread isn’t usually more than 8-12 inches either. This makes them an ideal size for a windowsill or tabletop plant to cheer up a room in your home. Flaming Katy requires bright, indirect light to thrive. They will do best in a west or east facing window for most of the year. Just be careful not to let your flaming Katy get too much hot, direct sunlight, or the leaves will get scorched. They can tolerate 1-2 hours of direct sunlight per day, which is why an east or west facing window is ideal, to catch the early morning or late evening sunshine, but remain in bright shade the rest of the day. If you live at higher latitude, with shorter days and weaker sunshine in the winter, you can safely move your Flaming Katy to a south-facing window, where it will get more of the weak winter sunshine. Feel free to put your Flaming Katy outside over the summer months if you wish. Just make sure it’s in a shady spot where it’s only going to get 1-2 hours of direct sunlight per day. I find that Flaming Katy plants tend to do really well if they get a few months outside, as it helps them grow vigorously in the vegetative phase and tees them up nicely for the shorter days of autumn and the run up to their blooming phase. Just take care that your plant is not exposed to night time temperatures of under 50 °F, so keep an eye on the forecast and bring your plant back inside well before temperatures drop. 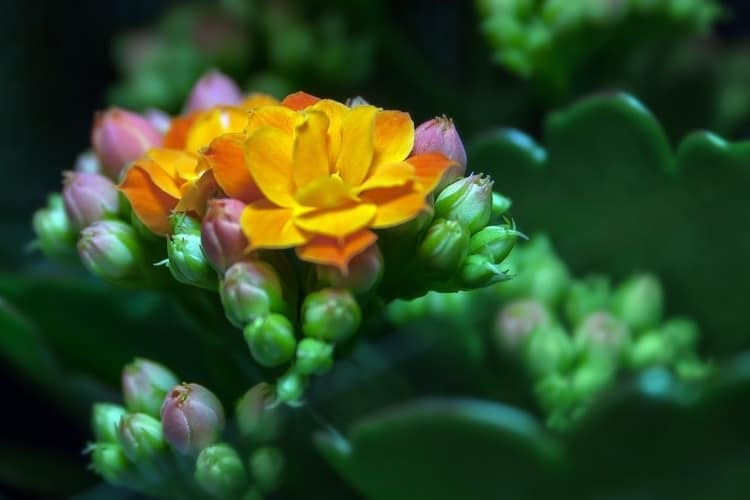 Kalanchoe blossfeldiana is a succulent plant, so bear this in mind when watering. You should only water the plant when the top half of the soil is dry. Kalanchoes tend to be quite drought resistant, and Flaming Katy is no different. This is good news for the slightly forgetful gardener. One of the biggest problems people have with Flaming Katy plants is overwatering. It’s a common issue with many houseplants. Flaming Katy can be prone to powdery mildew and root rot, so managing the watering well is a top priority. Another good tip is to avoid watering over the leaves. Flaming Katy has quite dense foliage and it’s easy for water to pool between the foliage which will increase the risk of fungal disease. Flaming Katy tends to require more water in the flowering phase due to increased water loss from the blooms. However, just keep checking the condition of the soil every day or two, and you’ll know when water is required. Kalanchoe blossfeldiana do best in temperatures between 65 to 80 °F, which makes them a great houseplant. They are fairly tolerant of warmer temperatures, so don’t worry too much if the temperature creeps up a little higher than this in the summer. The main thing to avoid is exposure to cold, so make sure to keep your plant above 50 °F at all times. Drafty windows can also cause some problems, particularly over the winter, where a draft can cause a localized dip in the temperature. Prolonged exposure to cold conditions can very easily be fatal for a Flaming Katy. Flaming Katy plants aren’t fussy about humidity levels, although are less prone to fungal disease in lower humidity conditions. Kalanchoes tend to be light feeders. I use a weak fertilizer solution twice per year on my Flaming Katy, but up to monthly should be fine. Feeding more frequently than this can cause problems with nutrient toxicity. Some people don’t even bother to fertilize their Flaming Katy and just repot every other year or top dress with compost to give the plants a bit of a boost. What Soil Do Flaming Katy Plants Need? You should use a well aerated, fast draining soil for your Flaming Katy to reduce the risk of problems with overwatering. An equal mix of potting soil and cactus mix is ideal, or a mix of potting soil, perlite and coarse sand. If your plant is in less well draining soil, you don’t necessarily have to repot it. Just be more careful when watering to make sure the soil is fairly well dried out between waterings. You don’t have to repot a Flaming Katy too often, about once every 3-4 years should be fine. Most people keep their plant well pruned, to keep it bushy, which does reduce the need to repot quite as often. The best time to repot is after flowering and pruning the plant, before the new vegetative growth starts. This will give the plant plenty of time to settle into its new pot and put on new vegetation before the next flowering season. A pot only slightly bigger than the original pot is best, to reduce the risk of overwatering. 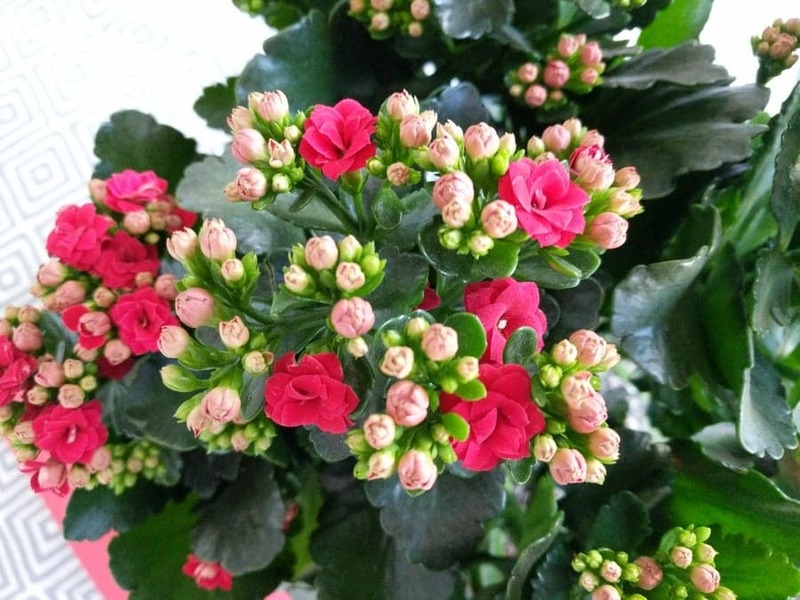 Kalanchoe blossfeldiana normally starts flowering in December and is popular in stores and garden centers in the run up to Christmas, and through the winter and early spring. They are available in a wide range of bloom colors, including red, orange, yellow, pink and white. The flowers are usually numerous and tightly packed, producing a really nice display of color. Flaming Katy plants will often flower for months at a time, and there are a few things you can do to prolong blooming time. Firstly, when you buy one from a store, try to pick a plant with more buds than blooms, rather than one which is out in all its glory already. Secondly, when you see dying or dead flowers on your Flaming Katy, pinch or cut them off, so the plant is encouraged to produce more flowers, rather than waste energy in producing seeds, which are not needed. There are two main reasons to deadhead a Flaming Katy plant. 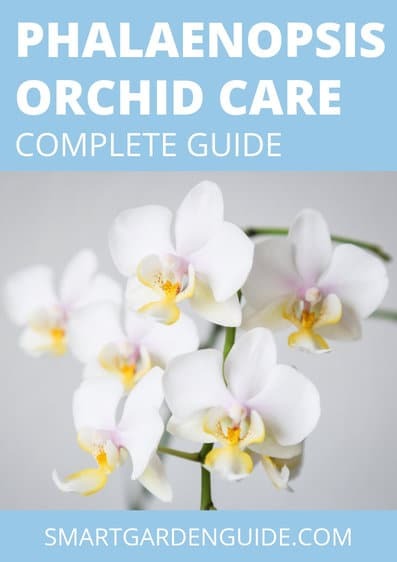 Firstly, the spent blooms tend to make the plant look untidy, so a plant which has blooming for a while can start to look a bit untidy and scruffy. Secondly, as mentioned above, removing dead blooms will stimulate the plant to produce new buds and more flowers, prolonging the blooming duration. You can either pinch off the individual flowers when they are dead, or if an entire stem of flowers has died, you are better to cut back the stem down to the base. Try to use a clean pair of pruning scissors or clean hands if you are pinching them off. The best time to prune a Flaming Katy plant is after all of the blooms have finally died. This is a good opportunity to reshape the plant, reducing it to the desired size and maintaining the size and shape that you want. The plant will be primed after flowering to start vegetative growth, so the plant should easily tolerate even aggressive pruning. As mentioned above, the most important thing is to use sterile pruning scissors and clean your hands prior to pruning, as the open wounds that will result from pruning increase the risk of infection for the plant. Thankfully, Kalanchoe plants are very resilient and not particularly prone to disease, but nevertheless, take reasonable care. The first thing to do is to trim off all dead flowers and trim back flower stems to just above a pair of leaves. Next, look at the shape of the plant and trim off any parts that look leggy or are causing the plant to be misshapen. I generally prune back quite aggressively to account for the vegetative growth that will happen over the next few months. If you have been growing your Flaming Katy in lower light conditions, it is more likely to be leggy, so this may prompt you to consider changing the location that you grow your plant. I normally fertilize my plant a few days after pruning, to encourage new root and foliage development and to assist the plant in recovering from the pruning. Kalanchoe Blossfeldiana is fairly easy to propagate, as many succulent plants are. You can propagate them by leaf or stem cuttings, but I would highly recommend stem cutting propagation, as its really easy and fairly reliable. Here’s a step by step guide to help you. A good time to propagate your Flaming Katy plant is in the late spring. This is the start of the vegetative growth period for the plant, so your cuttings are more likely to grow. But, you can propagate at any time of year as long as you provide the right conditions. Pick a stem with at least two pairs of healthy green leaves. Cut a section of stem from the plant of at least 3 inches (7.5 cm) in length). Remove any leaves at the bottom of the stem to ensure that there is at least an inch (2.5cm) of bare stem. Leave the cuttings for about 48 hours to let the cut end of the stem dry out and heal. The cut end will form a callus and will reduce the risk of the stem rotting when you plant it. Prepare your propagation tray or pot. You should use a potting mix of half potting compost and half perlite or coarse sand. Or, half cactus mix and half potting compost will do very well. Press the potting mix into the propagation tray or pot. Make small holes for the stem cuttings. The size of the hole should by a little wider than the width of the stem. You will then be able to insert the cuttings without damaging them. I usually use a small amount of rooting powder on the end of the stem cuttings. This isn’t necessary, but it increases the success of the cuttings when I use this. I sometimes dip the end of the stems in water before the rooting powder to help it stick to the end of the stem. Insert the ends of the stem cuttings into the pre-prepared holes in the potting medium. Compress the media to secure the cuttings in place. Lightly water the soil. Don’t saturate it, as there is a higher risk of fungal disease if the cuttings are excessively wet. I cover the cuttings for the first 2 weeks with polythene to create a mini greenhouse. Propagation trays are great for this, but you can improvise. Place the cuttings in bright, indirect sunlight in temperatures of 70 to 80 F (21 to 27 C). Mist the soil and cuttings every 1-2 days, to keep the soil slightly moist. If any of your cuttings develop signs of fungal disease, remove the affected plants. Leave the others uncovered if this happens. There is no rush to transplant the cuttings to individual pots. They will grow happily in propagation trays for a few months. But, in practice, I transplant my new Flaming Katy plants into separate pots after 3-4 weeks. There are another few options for propagating. These include leaf cuttings and water propagation. You can set leaves directly on the soil of a prepped propagation tray. Treat them in the same way as stem cuttings. They take a lot longer to root, but can be successful. Or, you can propagate stem and leaf cuttings in water. A narrow-necked jar is ideal for this. Place the bottom 1-2 inches of the cutting into the water and watch the magic happen. Keep the water level topped up so the end of the cutting stays in the water. Within a few weeks, roots should be growing strongly and you can transplant the cutting to a pot. Although Flaming Katy plants are perennial, meaning they will flower year after year, most people treat them as annuals. The main reason is they have a reputation for being difficult to rebloom, but the reality is they are not difficult, just particular in their needs. It’s great to get such a beautiful houseplant that flowers so prolifically through the winter and the reason it does this is quite interesting. Like some other popular winter houseplants, like the poinsettia, Flaming Katy is a short day plant. This means that it needs short days, or rather, long nights, to stimulate bud and flower production. Flaming Katy plants needs at least 12 hours of complete darkness per day for 6-8 weeks to stimulate flowering. Interestingly, I don’t just mean at least 12 hours of night time. Flaming Katy plants are also sensitive to artificial light, so if you’re trying to get one to rebloom at home, you need to ensure that it is kept in the dark for at least 12 hours per day in the run-up to reblooming. If you live in higher latitudes, your climate will naturally provide long autumn and winter nights, so reblooming should be less of a problem. The main challenge is to place it somewhere in your home that it will not be disturbed by artificial light in the evenings. Although I will have my Flaming Katy in pride of place while it is blooming, for the 3 months from mid September to Mid December, I keep my plant in a spare bedroom, where it will not be disturbed. I make sure not to turn the light on in this room unnecessarily in the evenings, and the natural shortening of the days where I live ensures that little else is required to ensure reblooming. If you live in a more equatorial region, you’ll have to work a bit harder to get your Flaming Katy to rebloom. The best thing to do is to put your plant in a dark cupboard at 6pm every night from mid October and take in out again in the morning at 7 or 8am. By about mid-December, you should have done enough, and the plant should burst into bloom. Obviously, it’s considerably more effort to have to get a plant in and out of a cupboard every day, so this may be more effort than you’re willing to put in when you can just pick another up at the store. Flaming Katy plants are great to display on windowsills and tables and provide a real splash of color at a time of year when a lot of other plants will not be flowering. 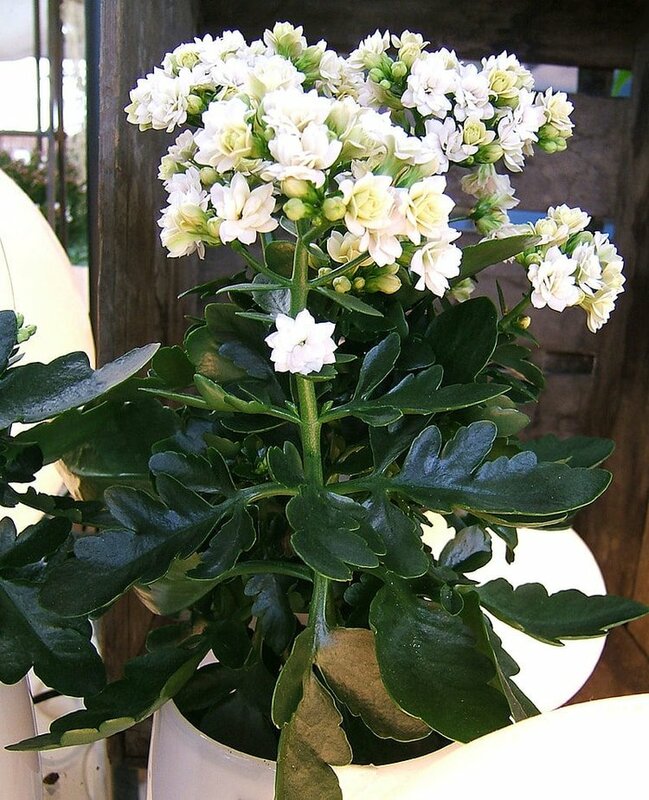 Sometimes kalanchoe plants are sold in attractive pots with decorative wrapping around them. The temptation is to keep these decorative wrappings around the pots, but you need to have some caution if you do this. The number one cause why people struggle with kalanchoe plants is overwatering. Kalanchoe plants are succlents and are prone to fungal disease and root rot if overwatered. Decorative wrappings often cover the drainage holes of pots and can exacerbate any overwatering issues. If your Flaming Katy comes with decorative wrapping around the pot, I would suggest that you either remove it, or ensure that drainage isn’t restricted by it. Another good option is to double pot your Flaming Katy. Keep your plant in a well-draining inner pot, and a decorative outer pot without drainage holes. This has the added advantage that you can safely place your Flaming Katy on furniture which might be damaged if water was to drain out of the bottom of a pot. Why Is My Kalanchoe Dying? Thankfully, Flaming Katy plants, like other kalanchoe are fairly easy to care for, but there are a few common issues, which I will discuss now. 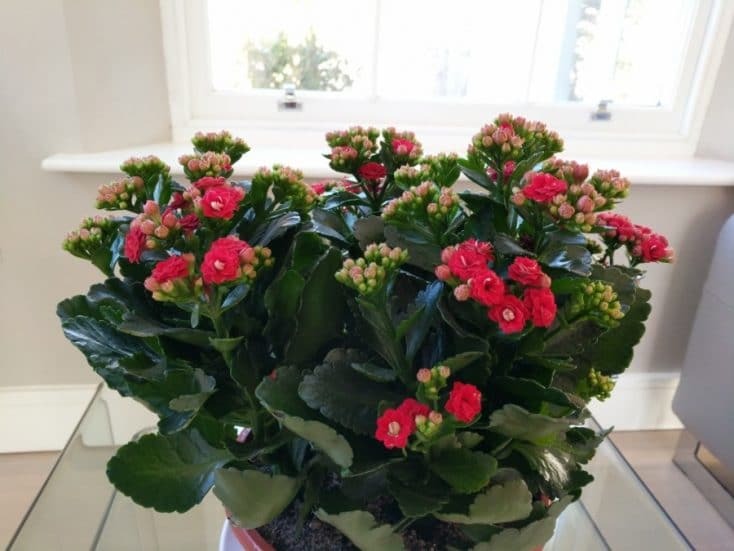 Why Is My Kalanchoe Wilting? The most likely reason for wilting is overwatering. Kalanchoe plants are quite drought tolerant, so wilting leaves is much less likely to be a problem with underwatering. Overwatering can easily cause root rot, which kills the roots and prevents them from absorbing water, causing a deficiency of water in the plant. Feel the soil. If it is completely dry, underwatering may be the issue, but if the soil is damp, there is a high likelihood overwatering is the problem. The best solution is to repot the plant, assessing the roots when doing this. Remove any roots affected by root rot and repot in well draining potting mix. Root rot can be fatal for a kalanchoe plant, so do not be surprised if the plant cannot be saved. Why Is My Kalanchoe Dropping Leaves? There are quite a few reasons why your kalanchoe can drop leaves. Overwatering or underwatering can cause leaf drop. Overwatering can cause leaves to swell and root rot to set in, causing leaf drop. Underwatering can cause leaf drop due to dehydration. Insufficient light can cause leaf drop, but is normally preceded by yellowing of the leaves. One of the more common reasons for leaf drop is exposure to extremes of temperature. Flaming Katy plants are particularly sensitive to low temperatures, and as many are sold in the winter, it is easy to accidentally expose them to temperatures of below 50 F, which can cause leaf drop within a matter of days. Succulent plants will also generally drop leaves when exposed to excessively high temperatures, and Kalanchoe blossfeldiana is no different. In addition to these, pests and disease can cause leaf drop, and I’ll tell you a bit more about these below. Kalanchoe blossfeldiana is prone to powdery mildew. This can be quite contagious and can prove fatal to your Flaming Katy if not detected and treated early. You will notice a powdery white coating on the leaves and stems, that can become fluffy in appearance if left to progress. It is more common in low light conditions, with reduced air circulation and temperatures of about 70 F (21 C). If you identify this, you should treat it immediately with an appropriate fungicide, remove any badly affected leaves, and move your plant to somewhere with higher light and airflow. Mealybugs are another potential invader of your Flaming Katy. These little white insects will cause stunting of the growth of your plant, yellowing of leaves and leaf drop. They feed off the sap in the leaves of the plant, multiply rapidly and can eventually overwhelm the plant, killing it. The first symptoms of a mealybug infestation are the appearance of fluffy white deposits at the base of stems and sheltered locations on the plant. Often eggs will be seen on the underside of leaves. Mealybugs produce a sticky fluid called honeydew which tends to encourage sooty mold to develop on the leaves. The best way to deal with this is to use an alcohol rub to clean the plant, or use an insecticidal spray. There are whole variety of chemical and non-chemical methods to control mealybugs. Aphids will appear as individual green, crawling bugs, which should be easily visible, You may also see the white skin casts of the aphids on the leaves. Again, aphids are parasitic to the plant, weakening it, which can stunt growth and cause leaf drop. There are plenty of effective control methods depending on your preference for chemical or non-chemical control. Flaming Katy plants are toxic to people and pets, so take care displaying this plant where pets and children can access it. Ingestion by cats and dogs most commonly leads to gastrointestinal upset. However, the flowers contain cardiac glycosides which can cause more serious health problems, including cardiac arrhythmias in larger doses. What Is Wick System Hydroponics?